Great line – I’m guessing it’s followed by a good minute of silence from the skeptics as they think of a retort. Looking forward to seeing Kennedy speak tonight with Chief Beck at the Central Library in LA. Way back in the late 1980’s I saw a T.V.news reporter ask a Black woman in D.C. about the “drug problem” in her neighborhood. She cut that reporter off at the ankles with this retort, “We don’t have a drug problem, we have a thug problem”. Kennedy was up here speaking in Oakland on Tuesday night, where “We’ve got crime!” is our civic motto–at least among citizens if not among denizens of City Hall. The same night Oakland City Council chambers were packed until midnight with citizens affirming or protesting proposed curfew, anti-loitering or gang-injunction legislation–proposals blatantly inappropriate in Oakland. We in Oakland have had experience with a Kennedy-style “ceasefire” program. In the past two years we’ve had huge gatherings of aroused citizens in our largest churches asking City Hall to fund more “ceasefire” programs. One of Kennedy’s colleagues, Steward Wakeling is, in fact, based here in Oakland at the Center for Public Health. City Hall is not interested in “ceasefire” and will not fund additional such programs. Elected officials cannot understand the psychology or social dynamics of gangs. “Ceasefire” programs, to be effective, need very careful and competent implementation. We can’t do that sort of thing in Oakland. Specifically here the “ceasefire” program did not work because there were not “jobs” available for gangbangers who entered the program. The problem wasn’t really that “jobs” were not available, but that city officials, not understanding psychology or sociology, were unable to come to a useful, locally-appropriate definition of what a “job” might be. A job is not just something you do from 9 to 5 for which you get a paycheck. Unfortunately city officials could not think beyond that very limited, and for this purpose useless, definition. to cling to their dope! When I was a poor college undergrad, living in Sin City (a local name for an eastern portion of LA county in the general vacinity of Pomona, CA), I came to accept my neighbors’ attitudes toward dope – it’s not a problem so much as it is the poor man’s vacation! @Keith: Thanks. It was good to see you. I’d forgotten that trope, which is very useful; I used in again tonight in LA, where they equally got it. @Mike: There’s a line in the book that reads, “I know how to control the bad guys. I don’t know how to control the good guys.” It’s still the central problem. Stewart and I and all the rest of us will keep trying. Thank you David. We citizens here in Oakland will keep trying too. As for controlling the Good Guys, we know how to control people perfectly: make it a crime for any officer/judge to miss any step in the implementation process. Plenty of actions involved in drug dealing aren’t mala in se, but we all know you have to prohibit them to reduce danger for others; officials that slouch in their efforts to eradicate drugs increase danger for others, too, so they should also get to experience the criminal justice system first-hand. Ultimately I’m not sure that this is more than a stopgap. 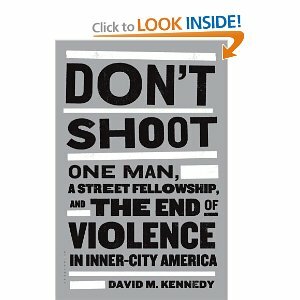 There’s plenty of violence in suburbs, just of less obvious and more socially acceptable kinds. paul, in most suburbs (particularly affluent suburbs) gun violence is rare and typically limited to men killing their wives/lovers and children, sometimes before committing suicide. In most suburbs teenagers die in car crashes (often caused by substance abuse). In fact, many suburbs have higher teen death rates than cities. In most cities teenagers die by gunshot. That’s Mr. Kennedy’s point. There’s no necessary correlation between drug use and drug dealing on the one hand, and gun violence on the other. @Paul: I work in communities where one in 200 young black men are murdered every year, where their shrines dot the streets, where people are afraid to go outside, and where kids put together their own RIP Facebook pages in anticipation of being killed. Saying that what goes on in dramatically safer neighborhoods is equivalent to that is wrong and morally abhorrent. Thanks for pointing out what should be obvious. I also work with teens from these communities and the problem is certainly this profound. The cycle of poverty and violence extends through families, across multiple generations, babies, siblings, cousins – entire networks of friends and neighbors. It thrives on low pay work, lack of education, ethnic rebellion, the breakdown of familial support networks, alienation and nihilism. I have no doubt that better policing strategies can have a great impact, but these deeper issues are still going to persist. And make no mistake, the anger, resentment, ignorance and lack of trust and acceptance of positive social norms will still flourish. They may not end with gun fire, but they will end in violence, drug abuse, theft and other dysfunctional, socially destructive behaviors. The problem is of course grand and will take interventions from multiple arenas, from the specific and individual to state and national policy. Eli, I won’t dispute anything you say about the broader social ills. None of it invalidates Mr. Kennedy’s point. 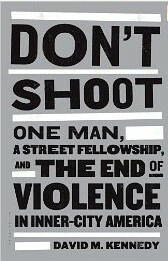 Take, for example, a community in which 1 in 200 young black men are murdered every year. That means that over the course of a generation (30 years), 15% of the young men are murdered. Prevent those murders…or just reduce them drastically to, say, 1 in 2,000. That results in 14% of the young men in a generation having a chance to do something with their lives other than get buried prematurely. Yes, some of them will overdose. Yes, some of them will get stuck in low-paying jobs. Yes, some of them won’t get much formal education. But some of them will overcome those obstacles. And all of them will have something they wouldn’t otherwise—a life. Right. I didn’t mean to invalidate anything. There is certainly a ton of progress to be made. I probably sound pessimistic. I just see the cycle unfolding everyday in my work and am biased towards getting frustrated with the bigger picture never really being addressed. This from a teacher, where one would think more progress is supposed to be happening. But kudos to positivity on the enforcement side of things, where it appears more leverage points can be found.